Editor’s Note: Traditional pedagogy is being challenged by information age technologies. Opportunities for students to use the internet to acquire, share, and collaboratively develop “learner generated content” shift the locus of control from “teacher as expert” to “ guide and collaborator” in the learning process. This paper encapsulates major issues for academe to resolve that result from societal and technological changes. This article describes how the emergence of “Web 2.0” technologies and social software tools is creating a new set of dynamics leading to increased user-led content and knowledge production that is transforming higher education curriculum and instruction. It considers the different ways in which social computing applications can be used for teaching and learning, and suggests changes to pedagogy based on greater learner control, agency, and engagement in content creation, as well as peer-to-peer sharing and review of ideas. It presents exemplars and cases of learner-generated content from universities around the world, and discusses themes of pedagogical transformation that emerge from analysis of these cases. It also discusses challenges facing the production and adoption of learner-generated content in higher education, and suggests possible ways forward to meet these challenges. In higher education, traditional approaches to teaching and learning are typically based on pre-packaged learning materials, fixed deadlines, and assessment tasks designed and stipulated by teachers. With the advent of and growth in popularity of “Web 2.0” (O’Reilly, 2005) services and tools, the increased prevalence of user-generated content (UGC) has implications for learning environments in higher education, and is already influencing pedagogical choices and approaches (Williams & Jacobs, 2004). The new affordances of Web 2.0 are now making learner-centered education a reality, with tools like web logs (blogs), wikis, media sharing applications, and social networking sites capable of supporting multiple communities of learning. These tools enable and encourage informal conversation, dialogue, collaborative content generation, and the sharing of information, giving learners access to a vast array of ideas and representations of knowledge. As a result, the one-way flow of information between teacher (as expert) and student (as novice) is now being challenged. In what is seen as a user-driven revolution, there is a shift away from the production of Web content by traditional, “authoritative” sources, towards content is that is generated by the users themselves. In academia, the users are students and they now have the tools, spaces, and skills to contribute ideas and publish their views, research, and interpretations online. UGC can come from myriad sources, and is a result of the ease with which social software can be used to create, share, augment, tag, and upload content. In this article, the authors take the view that the UGC movement is reshaping the debate over both what we teach and how we teach it. How is Teaching and Learning Changing? (cf. Downes, 2005, 2007; Dalsgaard, 2006). The reality is that today’s student “audience” is very much in control of the content found online; students are no longer passive consumers of knowledge but also producers, or “prosumers,” indicating a more active approach to learning (Klamma, Cao, & Spaniol, 2007). The Pew Internet & American Life Project (Lenhart & Madden, 2005) reports that approximately 50% of all teens in the United States, which equates to 12 million youth, not only participate in online activities but also create their own online content through blogs, personal Web pages, and remixing. Students, as members of the open culture of Web 2.0, are finding new ways to contribute, communicate, and collaborate, using a variety of accessible and easy-to-use tools that empower them to develop and share ideas. The most popular and fastest growing Web sites on the Internet (e.g. YouTube and MySpace) are all making use of this generativity, which is redefining how we think about creativity and provokes us to consider how new modes of community-based sharing and content creation might be applied to the more formal spaces of learning in colleges and universities. As a result of the changing profile of the university and college student (Windham, 2006), we are witnessing a blurring of the distinctions between learning, work, and play. New models for teaching and learning may be needed to replace traditional, “closed classroom” models that place emphasis on the institution and instructor. Many popular LMS’s commonly used by educational institutions to support online learning replicate these models, conforming to a classroom or lecture hall metaphor in their design, thereby further reinforcing instructor-centered approaches to teaching, learning, and content production. As such, many authors and commentators are suggesting that they may be outdated in the Web 2.0 era (Cross, 2006; Karrer, 2006). The inventor of the Web, Tim Berners-Lee (2000) foreshadowed a more active suite of tools that were not simply about passive downloading and consumption of information when he stated, “I have always imagined the information space as something to which everyone has immediate and intuitive access, and not just to browse, but to create” (p. 169). Now, social software tools that make it easy to contribute ideas and content, place the power of media creation and distribution into the hands of “the people formerly known as the audience” (Rosen, 2006), and that includes our students. A few examples will illustrate the new forms of participation enabled by social software tools. Youth are now engaged in creative authorship by being able to produce and manipulate digital images and video clips, tag them with chosen keywords, and make this content available to their friends and peers worldwide through Flickr, MySpace, and YouTube. Other individuals write blogs and create wiki spaces where like-minded individuals comment on, share and augment these sources, thereby creating a new genre of dynamic, self-published content. This outpouring of information and digital user-generated content between peers has been dubbed “personal publishing” (Downes, 2004). As to why people engage in such creation and production, the answer may lie in the ease of use and the urge to connect and share, or according to Wu (2005, cited in Anderson, 2006), “it has much to do with the desire of individuals to be noticed and gain exposure:”… the ‘exposure culture’ reflects the philosophy of the Web, in which getting noticed is everything” (p. 74). This stands in stark contrast to the control culture of education, where pre-packaged content and teacher-designed syllabi dominate, thereby denying students choice and autonomy in shaping their own learning trajectories. According to Dron (2006), such approaches lead to de-motivation, boredom, and confusion. The challenge for educators is to enable self-direction, knowledge building, and learner control by providing options and choice while still supplying the necessary structure and scaffolding. A growing number of teachers have begun to witness firsthand how social software tools offer rich possibilities for students to create and share ideas, and the take on roles as content creators. However, in advocating that students play an active part as contributors of content, the issue of what role content should play in higher education teaching and learning needs to be addressed. Boettcher (2006) suggests that there is a need to carefully re-evaluate the role of content in courses, and differentiates between three major types of content (Table 1). Represents vetted scholarship, developed primarily with the discipline and content perspective in mind, as opposed to catering for the individual learner or context. It may include textbooks and other readings, problems, tests, and quizzes assessing core concepts and principles, presented in either hard copy (printed) or electronic (CD-ROM, Web site, audio book) format. Materials produced specifically for a course and/or cohort of students by a faculty member prior to and during a course, and may include things such as the syllabus, projects, assignments, discussion reviews, assignment feedback/post-mortems, and responses to students’ questions. · “found” content, including the results of students’ own wide reading of Web sites, journals, magazines, and news articles that they bring to and share with one another in the learning environment. Sener (2007a) suggests that a move towards learner-generated content has the potential to change education for the better – for example by increasing student engagement, developing critical sites such as Google and Wikipedia. Instead, the real educational value lies in the facilitation of a learning experience in which the students are empowered to create their own content, thinking skills, and fostering a sense of community, while also resulting in products of lasting value to students individually, to peers, as well as to the wider community and society as a whole. The primary purpose of learner-generated content is to stimulate lasting, more permanent knowledge growth within learners through sharing and molding their unique knowledge structures, as well as through their active involvement in one another’s learning trajectories. There is also potential for some learner-generated content to be stored for later re-use. For example, Mayes and Dineen (1999) and Hartmann (1999) advocate the use of “tertiary courseware” in the form of educational dialogue such as questions, answers, and discussions (as opposed to primary courseware, which is courseware intended to present subject matter to students; or secondary courseware, which comprises the environments, tools, and materials used to facilitate the performance of learning tasks by students). While the application of tertiary courseware may support learning by supplying learners with feedback for conceptualizations and exposing them to other people’s understanding through vicarious participation (McKendree, Stenning, Mayes, Lee, & Cox, 1998) in the dialogue, Boettcher (2006) maintains that the key focus of learner-generated content is on the process of content creation and knowledge construction, as opposed to the end product itself. Supplied content is only one of many resources available to assist students in developing knowledge and skills, and has limitations, particularly if it pre-empts learner discovery and research, and active student involvement in the knowledge creation process. Learning with social software tools compels us to reconsider how new tools and the interconnectedness offered by Web 2.0 impact on pedagogy, and opens up the debate on how we conceptualize the dynamics of student learning. 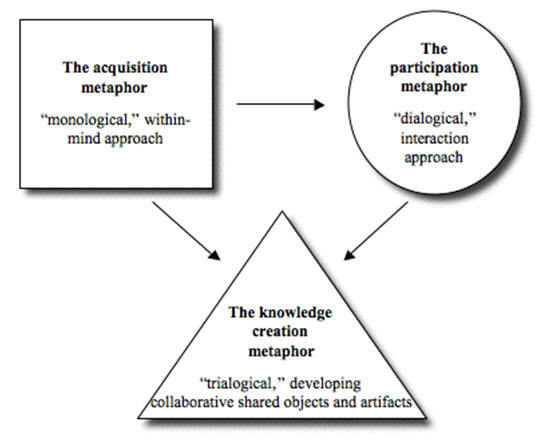 Sfard (1998) distinguishes between two metaphors of learning, the acquisition metaphor and the participation metaphor. The former represents a receptive view according to which learning is mainly a process of acquiring chunks of information, typically delivered by a teacher. An alternative model, according to Sfard, is the participation metaphor, which perceives learning as a process of participating in various cultural practices and shared learning activities. The focus is on the process, that is, on learning to learn, and not so much on the outcomes or products. According to this view, knowledge does not exist in individual minds but is an aspect of participation in cultural practices (Brown, Collins, & Duguid, 1989). Both individuals and their environments contribute to the processes of cognition, and learning is embedded in multiple networks of distributed individuals engaging in activities. By adopting a participation metaphor, learners engage in social processes of knowledge construction such as “enculturation,” “guided participation,” or “legitimate peripheral participation,” all of which are grounded in socio-cultural theory (Lave & Wenger, 1991; Vygotsky, 1978). However, learners are also capable of creating and generating ideas, concepts, and knowledge, and it is arguable that the ultimate goal of learning is to enable this form of creativity. Current views of knowledge regard the notion of an instructor-dominated classroom and curriculum as obsolete, and embrace learning environments where students take control of their own learning, make connections with peers, and produce new insights and ideas through inquiry. Thus, to keep pace with the content creation processes enabled by Web 2.0 and social software tools, it appears to be necessary to go beyond the acquisition and participation dichotomy. Paavola and Hakkarainen (2005) propose the knowledge creation metaphor of learning (Figure 1), which builds on common elements of Bereiter’s (2002) theory of knowledge building, Engeström’s (1987, 1999) theory of expansive learning, and Nonaka and Takeuchi’s (1995) model of knowledge creation. From the perspective of the knowledge creation metaphor, learning means becoming part of a community, through creation and contribution of learning resources. Students are both producers and consumers (“prosumers”), of knowledge, ideas, and artifacts. As newcomers to a community of practice, they not only engage in “legitimate peripheral participation” (Lave & Wenger, 1991) to develop their own mastery of knowledge and skills through interaction with experts such as their instructors, but also have a responsibility to play a part in the continued advancement of the community’s existing body of knowledge, as they move toward full participation in the socio-cultural practices of this community (Lee, Eustace, Hay, & Fellows, 2005). In a knowledge building community, members are managers, or “curators” of the community’s knowledge artifacts (Eustace & Hay, 2000), intent on making responsible decisions in addition to generating novel and innovative contributions to benefit the community as a whole. The knowledge building paradigm is therefore well suited to social learning environments where digital affordances and tools enable students to engage in rich and creative experiences, where they move beyond participation in communities of learning, to active creators of ideas, resources, and knowledge, as is evident in the processes underpinning learner content creation. Undergraduate students studying first year (freshman) level introductory IT subjects at Charles Sturt University and Bentley College have been working in teams consisting of a mixture of students from each institution. Each team is given the task of collaboratively producing a short podcast, to be recorded over Skype (i.e. a “Skypecast”), in which team members discuss issues/topics on technology and culture that are common to the curricula at both institutions. The students must overcome issues related to cross-cultural communication, as well as challenges that arise from working with team members whom they are unable to meet face-to-face, across disparate time zones, to produce the joint artifacts (Chan, Frydenberg, & Lee, 2007). To demonstrate essential generic skills such as communication, digital literacy, and presentation skills, as well as to construct and consolidate knowledge through creating multimedia learning objects for peers (Lee, Chan, & McLoughlin, 2006; Kukulska-Hulme, 2005; Evans, 2006; Frydenberg, 2006). While social software tools and learner-generated content offer fruitful prospects for empowering learners in line with the knowledge creation metaphor of learning, heutagogical approaches (Hase & Kenyon, 2000) to education such as those advocated in the present article will likely be met with considerable resistance and opposition from education practitioners and researchers. For example, as the expression goes, this is the era of “mix, rip, and burn, and there is concern that “students want to be able to take content from other people. They want to mix it, in new creative ways—to produce it, to publish it, and to distribute it” (Hilton, 2006). Such practices raise questions about the importance of originality from the point of view of academic integrity, and give rise to concerns about copyright, ownership, and intellectual property within the context of both student learning and assessment through learner-generated content. Moreover, in adopting learner-generated content for consumption by other students, there is a concern about the validity and reliability of the content that is produced. In response to these challenges, the authors believe that change is unavoidable and inevitable. Learning designs that hail the instructor and textbook as the sole authoritative, expert sources of information are incongruent with the rapidly changing social and technological landscape enabled by Web 2.0 and the open content movement. Today, we are witnessing a proliferation of personal publishing media and spaces using a range of free, Web-based services and open source software tools, along with the apparent random and open production and delivery of content. As content is increasingly mashed-up, blogged, and syndicated in numerous different locations, individuals have instant access to ever-expanding volumes of information, and are constantly bombarded by rafts of diverse and often conflicting ideas and representations. Information users are faced with the challenge of judging the quality of sources they come across, and discerning their suitability or otherwise for a variety of purposes. Beyond simple “search and retrieval,” the information must be contextualized, analyzed, visualized, and synthesized (Lorenzo & Dziuban, 2006; Windham, 2006). Recent research has shown that many higher education students currently lack the competencies necessary to navigate and use the overabundance of information available, including the skills required to locate high quality sources and assess them for objectivity, reliability, and currency (Katz & Macklin, 2007). To continue to “shelter” them from these challenges within a “closed classroom” academic environment would be to do them an injustice, as it would in effect be denying them valuable opportunities to develop the competencies they need to meet the demands and challenges of the twenty-first century workforce, and of life and lifelong learning in modern society at large. Students need to develop sound information literacy skills in effectively finding, evaluating, and creating information, which often involves complex critical thinking skills (Lorenzo & Dziuban, 2006; Windham, 2006). Many of the examples presented earlier in the present article demonstrate that the appropriate use of learner-generated content can also serve as levers for critical thinking and meta-cognitive development (e.g. Sener, 2007c; McLoughlin, Lee, & Chan 2006). In many educational scenarios and cases it may transpire that there is still a need for gatekeepers and other quality assurance/control mechanisms; however, the authors believe that the review, editing, and quality assurance of content can be done collaboratively and in partnership with learners, while also drawing on input from the wider community outside the classroom or institution (the notion of “wisdom of crowds” [Surowiecki, 2004]). For many teachers and administrators the major obstacle to embracing learner-generated content will be accepting the need to relinquish some degree of control, which they may be apprehensive to do since this is a major departure from the manner in which their jobs have traditionally been done and are expected to be done. Traditional views of instruction and curriculum design emphasize didactic and transmission-oriented methods whereby it is the teacher’s responsibility, as the expert, to impart knowledge to students. The case studies presented in this article suggest that not only will decisions have to be made in partnership with learners, but in addition, other stakeholders and communities must be actively involved in the process as well. Web 2.0 tools such as blogs, wikis, RSS, podcasting, social networking, tag-based folksonomies, and peer-to-peer (P2P) media sharing enable connectivity and make it easier for students to connect with and learn from one another. “Learner-generated content” is a reminder that with the help of such supporting tools, appropriate activities empower participants and allow them to exercise their creativity, enabling collaboration and the production of shared artifacts. A major outcome of learner-generated content is the “collective intelligence” or the “wisdom of the crowds” (Surowiecki, 2004) that emerges from working cooperatively, sharing ideas, and engaging in consensus decision-making with other learners/users in groups and communities that transcend the boundaries of the classroom or institution. Most of the user interaction in “Web 1.0,” characterized by technologies such as chat rooms, bulletin boards, and email, was centered around dialogue or conversation, which mirrors the participation metaphor of learning. With Web 2.0, the contributions of the community play a pivotal role, and many Web sites exist solely as vehicles for supporting those contributions. At the heart of the experience is actively generating and/or sharing data (files, music, photographs, video, interesting Web sites), often in a “remixed” or “mashed-up” fashion, corresponding to a merging of participation and creation. These changes are inevitable and unavoidable, given the morphing nature of higher education, including the fusing and merging of formal and informal learning and the rise of the millennial learner, within the context of even broader and more profound societal and technological changes. The main difficulty is a practical one: How do educators break down institutional containment fields while still retaining the coherence and credibility demanded of an educational institution? As the examples in this article show, the design of learning and assessment tasks must be a shared process between educators, students, and stakeholders who may be external to the academic environment. There must be a real delegation of academic ownership and judgment beyond classroom walls. In conclusion, the authors believe that educational technologies – including those that are part of Web 2.0 and beyond, are best used to supply support and scaffolding for learning and reflection within the authentic, real world contexts in which knowledge construction naturally occurs. A range of learner-centered pedagogies should afford students a true sense of agency, control, and ownership of the learning experience, and the capacity to create and disseminate ideas and knowledge. To deliver such an entitlement, we need to leverage the available technologies to extend and transform current practices, while keeping learners and the social dimensions of learning at the forefront. Anderson, C. (2006). The long tail: How endless choice is creating unlimited demand. London, England: Random House. Berners-Lee, T. (2000). Weaving the Web. New York, NY: HarperCollins. Chan, A., Frydenberg, M., & Lee, M. J. W. (2007). Facilitating cross-cultural learning through collaborative Skypecasting. In Proceedings of the ACM Special Interest Group for Information Technology Education (SIGITE) Conference (pp. 59-66). New York, NY: Association for Computing Machinery. Clark, D. (2003). The Napsterisation of learning (P2P). Brighton, England: Epic Group. Dalgaard, C. (2006). Social software: E-learning beyond learning management systems. European Journal of Open, Distance and E-Learning, 9(2). Retrieved January 7, 2007, from http://www.eurodl.org/materials/contrib/2006/Christian_Dalsgaard.htm. Downes, S. (2005). E-learning 2.0. ELearn, October. Retrieved January 11, 2006, from http://www.elearnmag.org/subpage.cfm?section=articles&article=29-1. Dron, J. (2006). Social software and the emergence of control. In Proceedings of the Sixth International Conference on Advanced Learning Technologies (pp. 904-908). New York, NY: Association for Computing Machinery. Eustace, K., & Hay, L. (2000). A community and knowledge building model in computer education. In A. E. Ellis (Ed. ), Proceedings of the Australasian Conference on Computing Education (pp. 95-102). New York, NY: Association for Computing Machinery. Engeström, Y. (1999). Innovative learning in work teams: Analyzing cycles of knowledge creation in practice. In Y. Engeström, R. Miettinen, & R.-L. Punamäki (Eds. ), Perspectives on Activity Theory (pp. 377-404). Cambridge, England: Cambridge University Press. Lee, M. J. W., Chan, A., & McLoughlin, C. (2006). Students as producers: Second year students’ experiences as podcasters of content for first year undergraduates. In Proceedings of the 7th Conference on Information Technology Based Higher Education and Training (pp. 832-848), Sydney, NSW: University of Technology. Lee, M.J.W., Eustace, K., Hay, L. & Fellows, G. (2005). Learning to collaborate, collaboratively: An online community building and knowledge construction approach to teaching computer supported collaborative work at an Australian university. In M.R. Simonson & M. Crawford (Eds. ), Proceedings of the 2005 Association for Educational Communications and Technology (AECT) International Convention (pp. 286-306). North Miami Beach, FL: Nova Southeastern University. Mayes, T., & Dineen, F. (1999). Developing tertiary courseware through capturing Task Directed Discussions. In B. Collis & R. Oliver (Eds. ), Proceedings of World Conference on Educational Multimedia, Hypermedia and Telecommunications (pp. 1061-1066). Chesapeake, VA: AACE. McKendree, J., Stenning, K., Mayes, T., Lee, J., & Cox, R. (1998). Why observing a dialogue may benefit learning. Journal of Computer Assisted Learning, 14(2), 110-119. Moore, J. W. (2003). Are textbooks dispensable? Journal of Chemical Education, 80(4), 359. Online Encyclopedia of Criminal Justice. (2006). Retrieved October 2, 2007, from http://cjencyclopedia.com. Paavola, S. & Hakkarainen, K. (2005). The knowledge creation metaphor – An emergent epistemological approach to learning. Science and Education, 14(6), 535-557. Rosen, J. (2006). The people formerly known as the audience. PressThink. Surowiecki, K. (2004). The wisdom of crowds. New York, NY: Doubleday. Mark J. W. Lee is an adjunct lecturer with the School of Education, Charles Sturt University (CSU), Wagga Wagga, Australia, and an honorary research fellow with the School of Information Technology and Mathematical Sciences, University of Ballarat, Australia. He was previously a full-time lecturer in Information Technology (IT) in the School of Information Studies at CSU. Prior to joining CSU, Lee was Head of the IT Faculty within the vocational education division of Study Group, Australia’s largest private education provider, and national IT and e-commerce coordinator for the La Trobe University and Oxford Brookes University programs delivered by the Australian Campus Network in Sydney, Brisbane, and Perth. Lee has published widely in the area of educational technology and e-learning. His current interests include educational uses of “Web 2.0” technologies, mobile learning technologies, and computer games, as well as pedagogy of computing (in particular programming). He is presently Chair of the New South Wales Chapter of the Institute of Electrical and Electronics Engineers (IEEE) Education Society, and serves on the editorial boards and review panels of several leading international journals. Catherine McLoughlin is an associate professor with the School of Education at the Australian Catholic University, Canberra. She also serves as the coordinator of the Australian Capital Territory branch of the The National Centre of Science, Information and Communication Technology, and Mathematics Education for Rural and Regional Australia (SiMERR). With over 20 years’ experience in higher education in Europe, South East Asia, the Middle East, and Australia, she has experience and expertise in a variety of educational settings, with diverse students and across a wide range of cultural contexts. McLoughlin’s publications attest to extensive research and development in e-learning, innovative pedagogy in higher education, curriculum design, and assessment strategies. Her current research interests include the use of social networking tools to support problem solving and meta-cognition. She is Editor of the Australian Journal of Educational Technology and an editorial board member of a number of leading journals such as the British Journal of Educational Technology.